Cisco Select Certification recognizes and rewards partners that have achieved the Cisco Small Business Specialization or Small Business Foundation Specialization. Cisco Select reflects a partner’s technological and business expertise specific to small and medium-sized businesses (fewer than 250 employees). We achieved Cisco Select Certification in 2008 and have continued to expand our experience in the Small Business Communication System and Cisco Unified Communications Manager as the have evolved over the years. 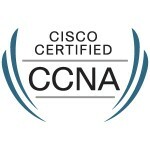 We have retrained and renewed our Cisco Select Certification every two years since and in 2012 took a further step to enhace our skills by becoming a Cisco Certified Network Associate. We specialise in the Cisco Small Business Pro range of products which includes Routers, Switches, Security,Wireless, Voice and Conferencing. This variety of network products allows us to design, supply, install and maintain a comprehensive network solution for your business.